The octopus has a remarkable ability--it can blend seamlessly with its surroundings, changing its appearance to mimic plants, rocks or even other animals. Similarly deceptive is an upcoming junk study from a Koch-funded think tank that has taken on the format and appearance of a truly scientific report from the US Government, but is loaded with lies and misrepresentation of actual climate change science. The false report is a tentacle of the Kochtopus--with oil and industrial billionaires Charles and David Koch at the head. "As authors of that report, we are dismayed that the report of the Cato Institute, ADDENDUM: Global Climate Change Impacts in the United States, expropriates the title and style of our report in such a deceptive and misleading way. The Cato report is in no way an addendum to our 2009 report. It is not an update, explanation, or supplement by the authors of the original report. Rather, it is a completely separate document lacking rigorous scientific analysis and review." The report's disgraced author, Patrick Michaels, has made his largely undistinguished career shilling for fossil fuel interests, including his stay at the Cato Institute, which published the counterfeit report. After admitting to CNN that 40% of his funding is from the oil industry alone, even Cato was embarrassed enough to clarify that "Pat works for Cato on a contract basis, not as a full-time employee. Funding that Pat receives for work done outside the Cato Institute does not come through our organization." Koch Industries Chairman and CEO Charles Koch co-founded the Cato Institute in 1977, and David Koch sits on Cato's board of directors. Both brothers are Cato shareholders. The Kochs' combined $62 billion in wealth comes from Koch Industries operations in oil refining, pipelines, tar sands exploration, chemical production, deforestation and fossil fuel commodity trading, all of which contribute to global climate change and the types of extreme weather Americans are now starting to recognize as symptoms of global warming. Wary of how public concern over climate change could drop demand for fossil fuel products, the Kochs have spent the last 15 years dumping over $61 million to front groups telling us that global warming doesn't exist, or that it would destroy our economy to stop runaway climate change. Other billionaire families like the Scaifes and companies like ExxonMobil have funneled tens of millions more to the same groups to bury climate science in public relations schemes designed to delay solutions to global warming. While Cato got over $5.5 million from the Kochs since 1997, it received over $1 million from the Scaifes, $125,000 from ExxonMobil and tens of millions more from other fossil fuel interests and ideologues in the top 1%. In a highly public battle earlier this year between the Koch brothers and libertarians at the Cato Institute, some Cato employees didn't want their work to become what David Koch calls "intellectual ammunition" for other Koch fronts like Americans for Prosperity. Cato's deceptive climate report is exactly the type of fake science that AFP needs in order to continue lying to the American public about the reality of global warming. Cato's counterfeit report is classic global warming denial that is clearly designed to be confused for actual science. Its author, its publisher and its billionaire supporters have all been key to the coordinated public relations effort that has blocked climate policy in this country by making climate science a partisan issue in this country and rallying the American public behind the very lies they themselves fabricated. The junk report has already been circulated by other climate science deniers and even cited in a Congressional presentation. With climate change already contributing to 400,000 deaths each year and costing $1.2 trillion to economies worldwide, such dubious doubt-peddling should be considered criminal. If you are an elected official or a journalist and spot the Cato Institute's bogus new report, call it for what it is: malarkey! Check out criticism of the fake report from climate scientists at the Daily Climate and additional comparison from Professor Scott Mandia. Why are the Koch brothers cannibalizing the Cato Institute? The Cato Institute may soon be under new management - Koch Industries. A cursory look at the very public clash between the Cato Institute, a libertarian think tank, and the Koch brothers, infamous oil billionaires and funders of right wing causes - leaves many people confused. The Cato Institute, originally called the Charles G Koch Institute when it was founded by Charles G Koch in the 70s – is in danger of a hostile takeover…by Charles G Koch? Why would Charles Koch try to take over his own think tank? The short answer – power, of course. As it turns out, the Koch’s influence at Cato has waned over the last few decades due to a falling out between Ed Crane, the current president of Cato, and Charles Koch, who hand-picked Crane for the job shortly after founding the think tank. Starting in the early nineties, the Kochs all but abandoned Cato, exerting little control over the group’s activities and steadily reducing Cato’s Koch funding (down to $0 in 2011). Charles even left the board of directors (though he was replaced by David Koch). Instead of running Cato, the Kochs poured their time and oil profits into front groups like Americans for Prosperity, their flagship astroturf organization. The Kochs' network of front groups gave them influence over (and close ties to) the republican establishment at large. During this time, Cato became seen as a relatively independent think tank, willing to criticize both democrat and republican administrations. Real news organizations went to Cato for comment on topical issues, and legislators used Cato’s reports to inform policy. 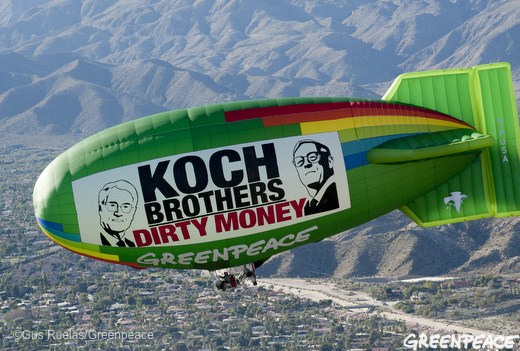 Fast forward to today – the Koch brothers’ political agenda has been publicly outed (see airship), their front groups like Americans for Prosperity have little credibility with the mainstream press and the Kochs’ hope of unseating president Obama is looking slimmer by the day. Suddenly, Cato’s veneer of respectability is politically valuable to the Kochs. So, when one of the shareholders of Cato died leaving his shares to his widow (Cato has a strange system of governance involving controlling shares), the Kochs saw an opportunity to pounce. The brothers filed a lawsuit they hope will force the widow into selling her shares, giving the Koch’s majority control over Cato’s board of directors. This would give the Kochs the power over Cato they needed to fold it into their suite of other front groups, making Cato another Koch-controlled cog in the republican political machine. Thus began the public brawl between the Koch Brothers and the Cato Institute. David and Julia Koch watch hundreds of protestors speak out against the pollution of democracy by the oily few for the oily few. Photo credit. Last June, Glenn Beck paused in the middle of a rant about the economy and climate on his television show for an important, if rather unexpected, aside. "I want to thank Charles Koch for this information," he said. Beck's statement was totally without context, thrown in amid jabs at Al Gore and endorsements of the free market. Months later, it came to light that he recently had been a guest of honor at a semiannual confab sponsored by fossil-fuel billionaire Charles Koch and his brother, David, an event the pair hosts to connect conservative think tanks, politicos, and media types like Beck. Indeed, the brothers have spent $31.3 million since 2005 on organizations that deny or downplay climate change, according to a forthcoming report from Greenpeace that updates its report on Koch's climate denial work released last year. But it's the web of media influence the Kochs have created that perhaps accounts best for their power—particularly when it comes to sowing doubt about climate change. On the other hand, the Kochs retained a heavy private security detail, which tracked resort guests deemed “suspicious,” erected a blockade Saturday to block a documentary camera crew from filming arriving guests, and removed a POLITICO reporter from the resort café under threat of arrest. Security manned every doorway and stairwell near the ballrooms where Koch events were held, and threatened to jail this POLITICO reporter while he waited in line at the resort’s café, after he stopped by a Koch conference registration table. The resort grounds were “closed for a private function,” the resort’s head of security, James Foster told POLITICO, ushering the reporter outside, where private security guards, wearing gold lapel pins bearing Koch’s “K” logo, threatened “a citizen’s arrest” and a “night in the Riverside County jail” if the reporter continued asking questions and taking photographs. Fortunately, there are people willing to scrutinize and stand up to the Koch Brothers and their polluter agenda, despite this intimidation. Tim Phillips and Gena Bell in a PR stunt. "Bell's pique grew when Phillips shot another video belittling an exhibit that showed what an energy-efficient home might look like in the future: a small refrigerator, a low-flow shower heads and a clothes-washing basin that directed used water into a garden." Phillips made fun of the model home's five-gallon water heater. "Good luck with that - I've got three teenagers!" he said to the camera. "I'm not on board with this," Bell said. "Ed [Bell’s husband] and I looked into that when we were looking at moving to Colorado." It is no surprise that AFP, funded by oil billionaire David Koch, derides sustainable technologies that would cut energy consumption (and Koch Industries’ profit). Whose interests does AFP speak for again? The average American or the oil profiteer who funds AFP in an attempt manipulate the political system? Gena Bell now knows why she is important to the Kochs and AFP, and whose prosperity they really care about. Koch Brothers, Cuccinelli, Peabody and others Named "Climate Villains"
Similar to Rolling Stone's "The Climate Killers" article that was released at the beginning of the year, AlterNet has just profiled some of the most influential political, financial and popular enemies of the Earth's increasingly disrupted climate. Snide comments aside, both reports nail some of the most influential staples: Koch Industries, an infamous engine of the climate denial machine; Warren Buffet, the filthy-rich investor who has placed his bets on coal; and Joe Barton, Big Fossil's purchased U.S. Representative (over 1.7 million dirty dollars over the last decade). AlterNet's newer spotlight identifies Harold Lewis and Freeman Dyson, who are similar to the likes of S. Fred Singer and Patrick Michaels in their use of scientific credentials for corporate public relations rather than, say, active climate studies...or scientific study in general. Also like Singer and Michaels, they have ties to prominent denier think tanks such as Cato, the Heartland Institute, and the Competitive Enterprise Institute, all of which are currently or formerly funded by Koch Industries and ExxonMobil. Similarly, AlterNet mentions Anthony Watts, whose skeptic blog is the go-to hub for climate-solutions obstructionism, and whose credentials as a TV weatherman (not certified by the American Meteorological Society) fool people into thinking he's a climate expert. Like the other junk scientists mentioned in the article, Watts has ties to the Heartland Institute. In a contrasting look at university integrity, AlterNet also profiles Ken Cuccinelli, Virginia's attorney general who has used the "climategate" nonscandal as grounds to continue harassing Michael Mann, the influential University of Virginia climatologist whose university research was a primary target of the hacked East Anglia emails. While Mann was defended by his university and cleared of wrongdoing after investigations, the same can't be said for George Mason University's Edward Wegman. AlterNet points out that Wegman is currently under formal investigation his George Mason for pushing bogus climate material for none other than Texas Rep. Joe Barton. It is worth noting that George Mason University (GMU) is a known breeding ground for climate deniers and heavily supported by the Koch brothers; both the Mercatus Center and the Institute for Humane Studies (IHS) operate out of the University have received millions of dollars from the Kochs. There's also Koch Industries executive Richard Fink, who taught and filled various other positions at GMU, co-founded and directs GMU's Mercatus Center, directs the Institute for Humane Studies, is the president of two Koch family foundations that fund these groups, founded the Citizens for a Sound Economy Foundation (which became the Americans for Prosperity Foundation, of which Fink is a director)...Rich Fink pretty much lives up to his name. Glenn Beck (who attended Charles Koch's secret election strategy meeting last June), Mitch McConnell, former BP CEO Tony Hayward, Peabody CEO Gregory Boyce, and others are also credited for their dirty work in the full article. Check Greenpeace.org for more Koch Facts. Following voter opposition to Proposition 23 and the recent surge in funding to counter the oily measure, Texas refiners Valero and Tesoro (who "are not oil companies," by the way) have respectively added $1 million and $500,000 to the fight. The dirty energy proposition would victimize clean energy jobs and development, not to mention legislative innovation and an already struggling climate. There has been a lot of confusion about how Prop 23 relates to jobs, as the oil industry has cultivated fears of job loss through some questionable studies. The Pacific Research Institute for Public Policy, which is funded by the likes of Art Pope and the Koch brothers, has crafted a report designed to create hysteria among economically-wary Californians (read: most Californians), claiming formidable implications on jobs and state economic output. The funny thing, and by funny I mean dishonest, is that this report conveniently avoids looking at the economic benefits of the climate law that Prop 23 would cripple. It also fails to mention that by the end of the decade, Proposition 23 will make California electricity cost 33% more. And it also doesn't note that the report's author has worked for the Cato Institute, which Charles Koch founded and David Koch remains a Board member, and the Manhattan Institute, yet another think tank funded by the likes of Koch Industries and ExxonMobil. For a deeper look, check out what Rebecca Lefton has to say about the Pacific Research Institute's selective look at California's climate law. Beyond publishing their own flawed report, the Pacific Research Institute is also promoting another attack-study to help sell Prop 23. This publication has been heavily scrutinized--to the point of invalidity--by California's Legislative Analyst's Office, the Business Alliance for a Green Economy, and two professors from Standford University and UCLA. This is not the first time that the Pacific Research Institute has used flawed studies to attack clean energy progress, as they continue to do with the heavily-touted, heavily-debunked "Spanish study." Pretty typical for one of the Kochtopus' many tentacles. For an excellent map of the oil money fueling Proposition 23, refer to Dirty Energy Money. The New Yorker published a must-read expose of Charles and David Koch this week, detailing the major role that these oil billionaire brothers have played in funding organizations that misrepresent the science of climate change like the Cato Institute, front groups like Americans for Prosperity, and others that aim to block progress on climate solutions and keep America addicted to fossil fuels . The article includes information from Greenpeace’s report, Koch Industries: Secretly Funding the Climate Denial Machine. The Kochs are longtime libertarians who believe in drastically lower personal and corporate taxes, minimal social services for the needy, and much less oversight of industry—especially environmental regulation. These views dovetail with the brothers’ corporate interests. In a study released this spring, the University of Massachusetts at Amherst’s Political Economy Research Institute named Koch Industries one of the top ten air polluters in the United States. And Greenpeace issued a report identifying the company as a “kingpin of climate science denial.” The report showed that, from 2005 to 2008, the Kochs vastly outdid ExxonMobil in giving money to organizations fighting legislation related to climate change, underwriting a huge network of foundations, think tanks, and political front groups. Indeed, the brothers have funded opposition campaigns against so many Obama Administration policies—from health-care reform to the economic-stimulus program—that, in political circles, their ideological network is known as the Kochtopus. 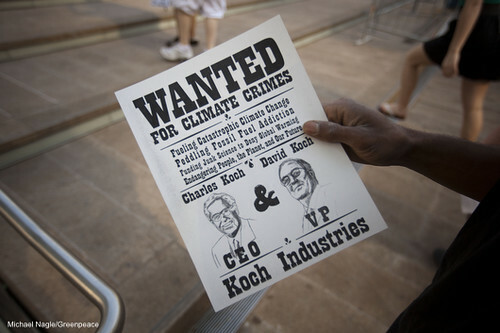 "In his office, Koch showed me a photocopied flyer Greenpeace had produced with sketches of him and Charles below the words wanted for climate crimes and shook it in the air." Maybe David Koch can use his copy of the flyer as a bookmark when he reads how his shadowy oil-funded network has been exposed in this week's New Yorker Magazine. Check out the full article for all the details. PolluterWatch is a project of Greenpeace that holds polluters accountable for the work they’re doing to block the transition from the dirty fossil fuels of the past to the clean energy sources of the future.